In a week I depart for Sweden. I fly Asheville-Chicago-Stockholm—I was amazed I could do it with just one connection. I spend a day in Stockholm and take an overnight train, an 18-hour ride, to a place called Ritsem on the border of Sarek National Park. I backpack with a group for nine days, going through valleys and making side trips to climb a few peaks. 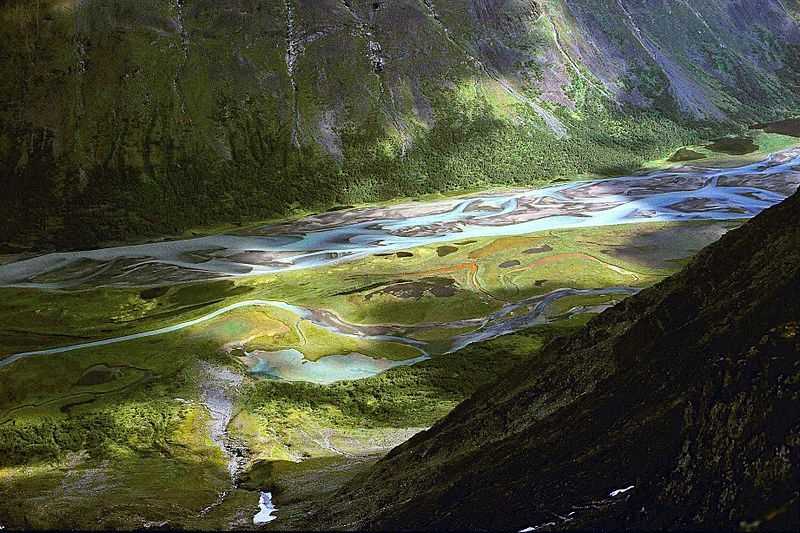 There are no trails in Sarek. Now you know why I was interested! This expedition is organized by a British company called Nature Travels that specializes in adventurous trips in Sweden and Norway. They say the groups going to Sarek typically include quite a few Scandinavians. It is difficult even for Swedes to navigate through the park unassisted. I ‘ll have one more good hike before I go, leading a Smoky Mountains Hiking Club outing up No Name Ridge, and I depart next week. I return early August—spending another day in Stockholm before flying home. The park has many glaciers—you see in the photo a typical braided river, tinted blue from glacial silt, flowing through a U-shaped valley. 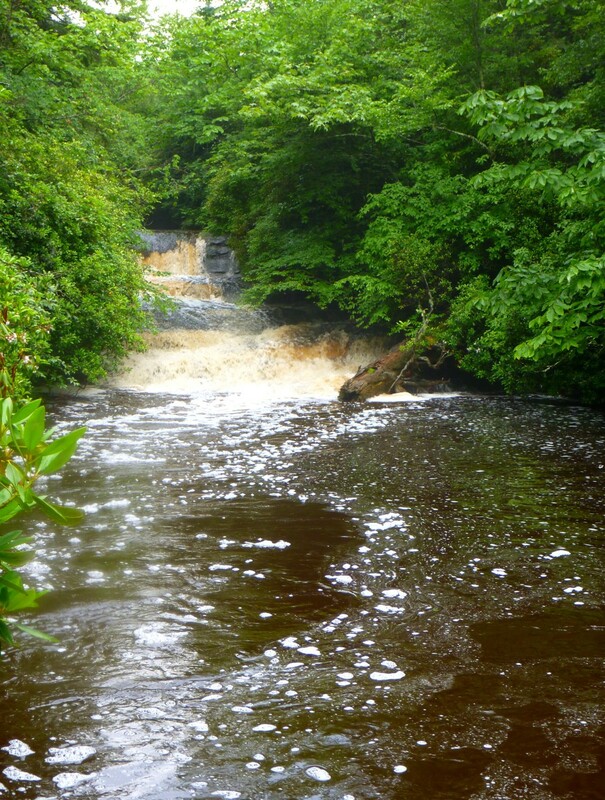 Stream crossings are a major challenge. I hope to see reindeer and bears. We will have about 22 hours a day of sunlight. The whole thing is nearly impossible for me to imagine. But I am sure of one thing—it will be amazing. 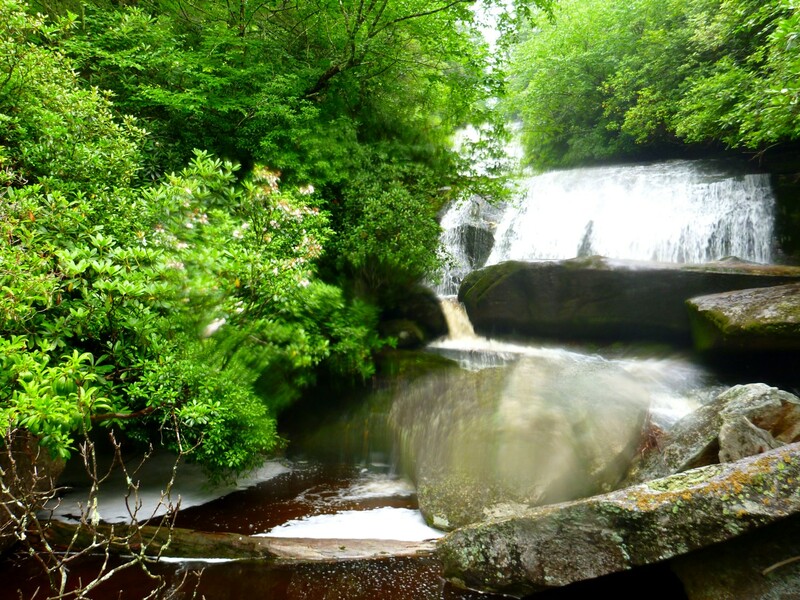 Posted by Jenny in camping, hiking, Nantahala National Forest, Pisgah National Forest, Southern Appalachians. Last weekend I went backpacking in Panthertown with my new friends Dana and Cathy. The plan was to meet Friday morning, camp two nights, and come out Sunday. We had no set itinerary—just the desire to wander about ethereal realms of granite plutons and splendid waterfalls. Plus, Dana had a really good tip about a beautiful place to camp, not far from the Cold Mountain Road entrance. 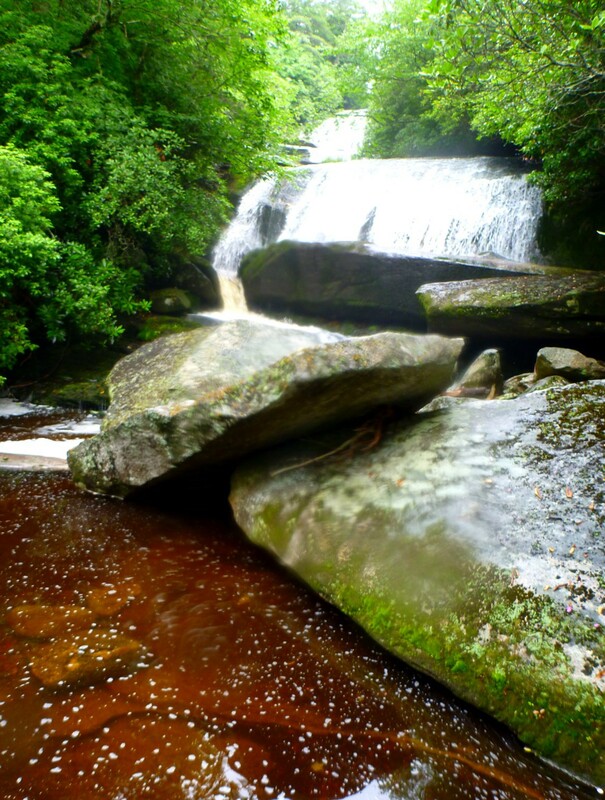 Panthertown is located south of Sylva NC and west of Brevard NC. 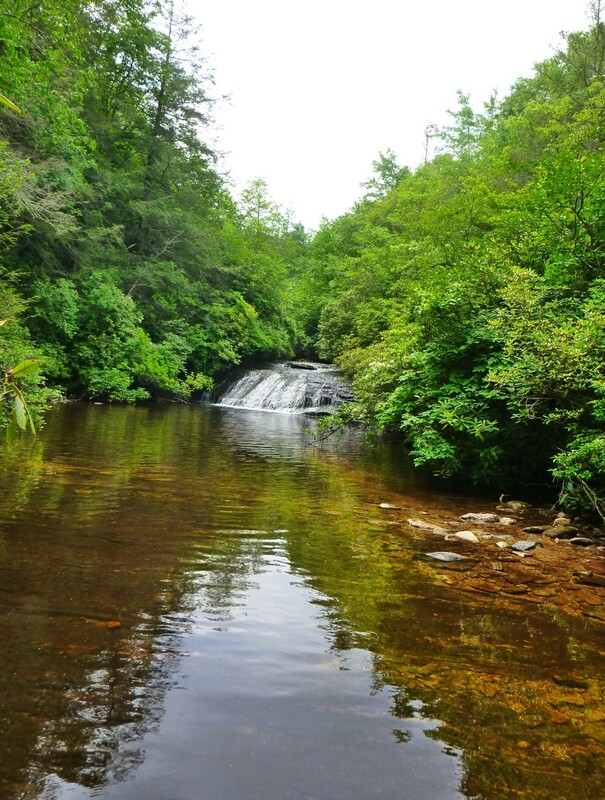 It is considered to be partly in Nantahala National Forest and partly in Pisgah NF. As it turned out, we got rained on pretty hard a few hours after we arrived. 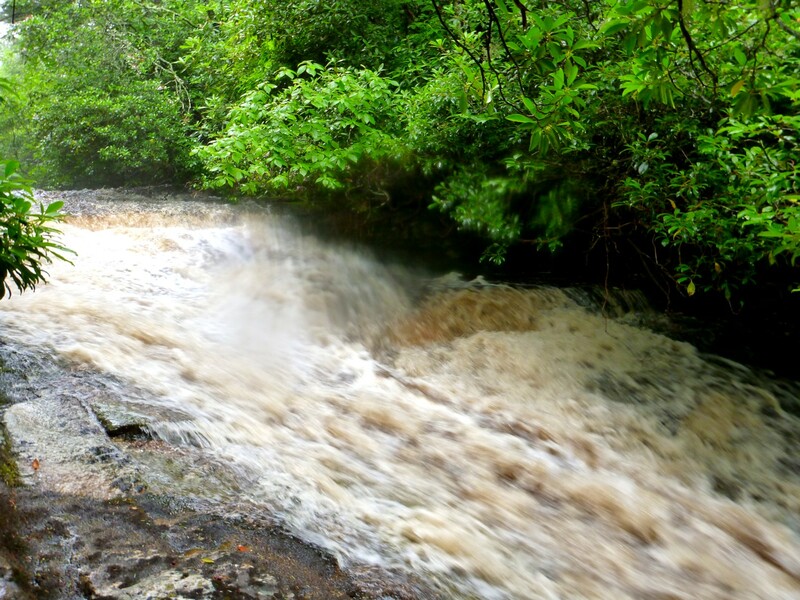 In some ways that was bad luck, but in one way it was nice—we got to see some of the waterfalls foaming and roaring from the heavy rainfall. I opted to leave Saturday morning because I had aggravated a chronic hip flexor problem two days earlier on a bushwhack up Cole Creek and it was really bothering me. Dana and Cathy opted to leave Saturday evening because everything was so wet and dirty by that point that it made sense to go home and dry off. 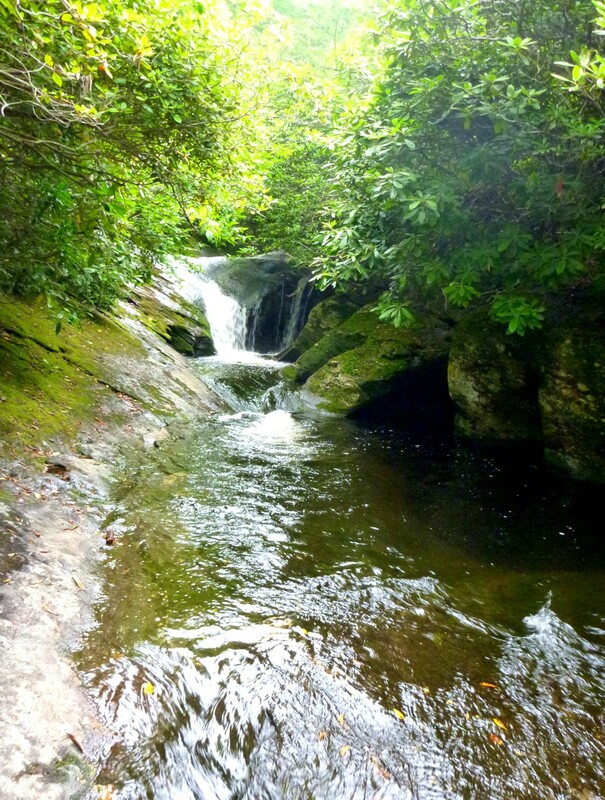 We started by going up the Mac’s Gap Trail to the Greenland Creek Trail and turning northwest to go along a pretty rough pathway to see a couple of falls. There were lots of roots and rocks and steep little climbs, but that’s what Panthertown is all about. First we came to Mac’s Falls. It was jungly along the edge of the stream. Mac’s Falls from downstream. Peaceful. A little further along we came to Pothole Falls. We headed back upstream and located the camping spot Dana had heard about. It was just perfect, carpeted with pine needles and right beside the amber waters of Greenland Creek. There was even a tiny beach area with very fine grains of sand. The only problem was that at this point it was pouring—just as we were trying to set up our tents. I was in such a hurry to get my tent up that when I yanked it out of its stuff sack, the little bag with the tent pegs went flying into the brush and I didn’t even see it go. Then, when I couldn’t find the pegs, I figured I’d left them behind the last time I used the tent. Dana and Cathy had extras which they kindly loaned me. Dana spotted the little bag when they broke camp. 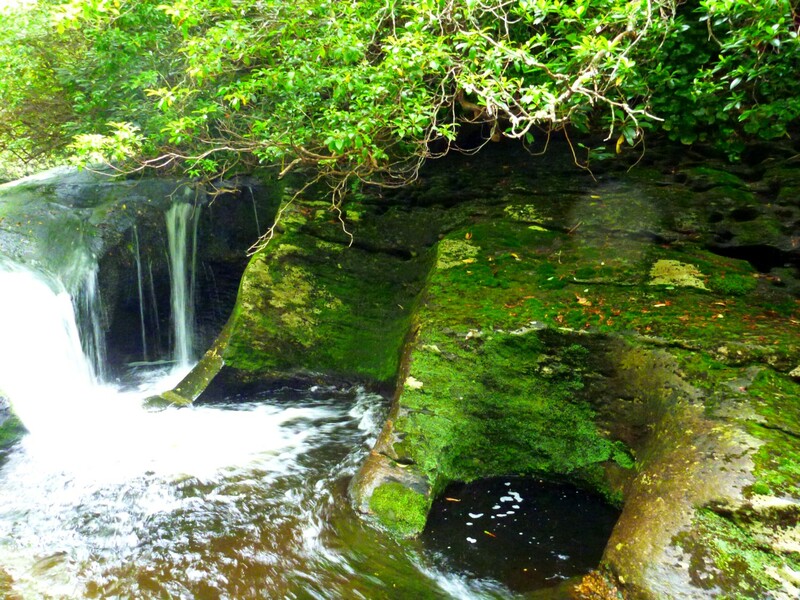 After we got things set up, the rain tapered off and we explored the three falls upstream from there. 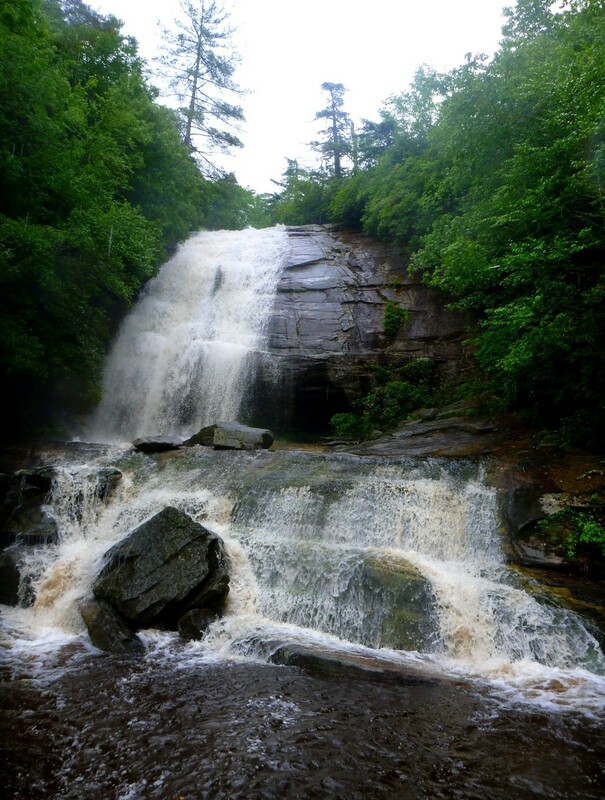 First was Greenland Creek Falls. 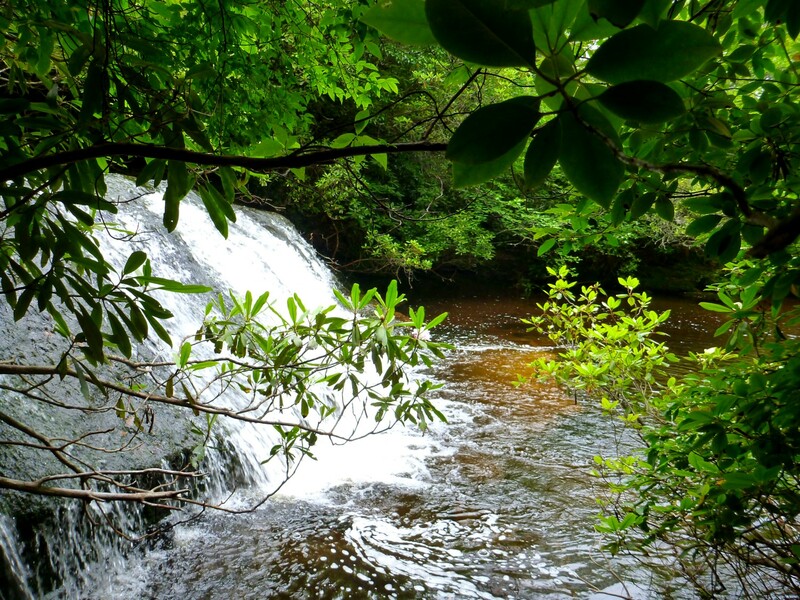 Beautiful the way the Panthertown falls are all fringed with luxuriant green. The water was churning and foaming from the rain. To me, it had a strangely industrial sound, as if subterranean machinery was busily at work. I remember saying to the others, “It sounds like a machine,” but I couldn’t quite explain what I meant. The fogging on my lens got worse as I went along. Well, at least it gives you a feel for how damp things were. Patterns of foam below Halfway Falls. 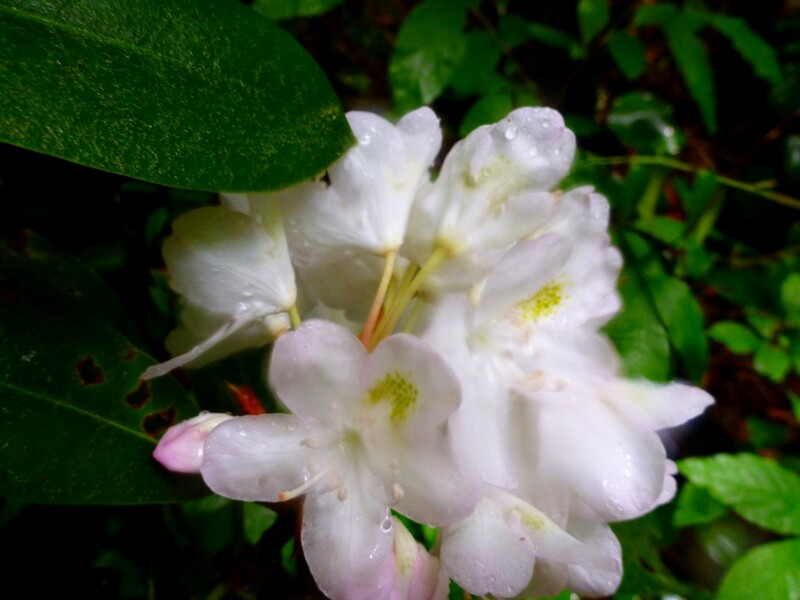 This rhodo blossom wanted to be admired. We came to the uppermost of the falls, Carlton’s Falls. Contrast between white foam and dark amber pool. I took a picture of Dana and Cathy. 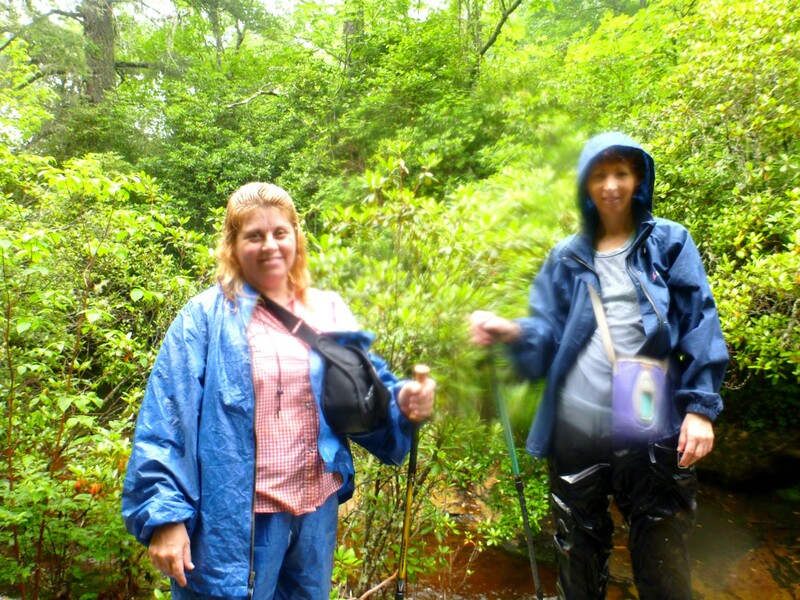 Unfortunately, the fogged-up lens turned Cathy into a ghost. Dana and Cathy with fog on the lens. We returned to camp and had supper. Afterward, I wandered up and down Greenland Creek a short distance and gazed at the beautiful stream. There is no other place quite like Panthertown.